As I look at the DVD’s box art, I’m reminded that I don’t care for this art style. 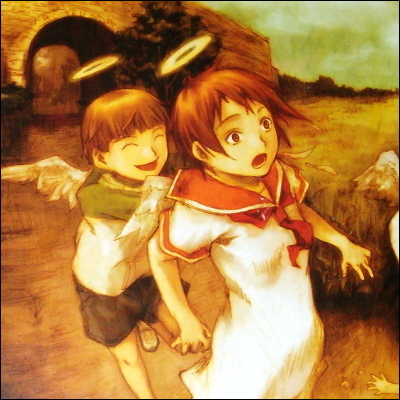 I never have cared for it, no matter how many Haibane-Renmei artworks I’ve seen. I don’t dislike it, but it’s not an art style that makes me want to see more. I bought Haibane-Renmei about a year and a half ago, and haven’t even seen a single screenshot until now, looking at the screenshots on the back of the DVD cases. The style reminds me of the Love Hina winter special, but I’m going on a few small screenshots here. I was taken by surprise to see a companion pamphlet in the first DVD case. I’ll wait until I finish the first DVD before I check it out. Even though all its contents could easily be typed up, all its images scanned, all posted online, it’s still a nice bonus for someone who buys the series. I assume the other three DVD cases have their own pamphlets, with translation notes, character information, and side stories, but I haven’t checked. I’ve decided to make this the first series where I watch episodes in English first, then in their original language second. I’ve wanted to try this for some time now, but always feared I’d end up preferring the English dub over the original language. “Feared”? That’s right, feared. In DiC’s Sailormoon dub, I like Katie Griffin as Raye and Toby Proctor as Darien. I like one of Serena’s two voices (not the one from the first few episodes). I like Molly’s accent, and Nephlite’s voice is perfect. In Kiki’s Delivery Service, I simply cannot get used to Jiji’s Japanese voice. Come to think of it, whenever I think of Luna, I hear her English voice as well. Both cats have English voices vastly unlike their Japanese. Scratch that. First series where I’ve explicitly and actively chosen to watch dubbed first, where the original language and dub are both available. I’ll still watch an episode in both languages before moving on to the next episode, but I’ll be doing so English first, then Japanese. I know nothing about this series, only that I found acquaintances highly recommending it whenever I’ve mentioned it being on my to-watch list. Hopefully it will be an enjoyable series with captivating characters and a decent storyline. I love Haibane Renmei so I’m going to follow along with these blog posts. Clearly I am insane, then =) All I can say is I have trouble “seeing” what’s in artwork like this. A quick look at RahXephon on Wikipedia (looking at the first paragraph), it doesn’t sound like something I’d watch, but if I ever see it as a box set for a low price, I might pick it up just to explore something out of my genre comfort zone. I’m especially eager to see whenever a dub is done right. Thanks for the recommendation! IIRC, you watched EVA, so RahXephon is not too far fetched, being essentially a vastly improved EVA. I think Laputa is the best of steampunk, but it’s a movie, not series. Laputa is one I enjoyed (it’s one of the first anime movies I saw, after Nausicaa, Totoro, and Grave of the Fireflies). Not necessarily a genre of choice for me, but I think it appealed to me because of the young age for the two main characters. That, and the story was nice with a good number of parts of scenes simply followed the characters without directly relating to the overall story. Anyway, your take on the art is interesting. ABe has exactly the opposite view you do. Where you want the sharp outlines and high contrast colors, ABe has stated that he doesn’t understand why so much anime art uses things like that. From his perspective, he says it makes it hard to figure out where the artist wants you to focus your attention. In this series, Reki’s painting of Kuramori is a good example of how he uses color for emphasis. Of course, he’s trained in classic Japanese painting, and wasn’t allowed to read/watch much manga or anime as a kid, so he doesn’t approach it with the same background as most anime artists do. Personally, it’s my favorite art style. Serial Experiments: Lain was the anime that really got me hooked on the medium, and the unique art style was part of that. Since then I’ve been following everything yoshitoshi ABe was involved with. As far as the pamphlets go, the US release doesn’t get them all. The Japanese release had a booklet with each DVD release, and a total of five DVDs. The US one takes pieces from all the books, unfortunately including some spoilers. No comment on the dub. Since I followed the original airings and bought the Japanese first pressing DVDs, I had already seen the series too many times to be able to watch it without the English voices feeling wrong. This is the only work of ABe’s that I’ve seen, but from what I’ve read about how the story was put together, he’s definitely got a lot of training to him. He’s able to put together a wonderful thing, but at the same time the writing is much like the artwork: anything we shouldn’t focus attention on doesn’t get a big spot in the story. There’s nothing leaving the viewer uncertain of which elements to keep following, and which to let vanish into the background.